Albert Small was born in England in 1885 and came to the United States in 1903. In 1907 he married Eva Clements, who was also from England. The couple lived in Ottawa, Illinois. Mr. Small operated heavy machinery and handled explosives in the sand pits of the Ottawa Silica Sand Company. In his spare time, Mr. Small worked on his collections and did many interesting arts and crafts. Among his collections were stamps, tropical fish, 100 cactus plants, and 3000 salt and pepper shakers. His artistic hobbies included building wooden chests with inlaid designs, painting in oils and watercolor, designing and piecing quilts by hand, and even tattooing people. He also enjoyed traveling by train around the country. How Did He Begin Making Quilts? In 1951, one of the headlines on a "Ripley's Believe It or Not!" newspaper column read: "Albert Small makes a MOSAIC quilt with the largest number of pieces ever sewed!" 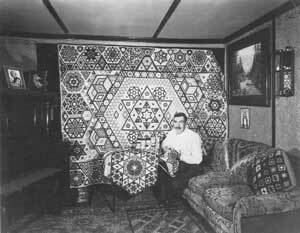 Mr. Small probably enjoyed reading that headline, since he was determined that his quilts were not to be outdone. The story of how Mr. Small began quilting reveals his sense of humor and how much he loved a challenge. During the 1930s, there was a quilt-mania in this country. Mr. Small's wife, Eva, belonged to a quilting group. Mr. Small sometimes teased members of the group about their work. So, one day they challenged him to do better!